Josephine Baker was an entertainer in the truest sense of the word. She had a charismatic personality that enchanted audiences and entertained people from around the world. Baker was a tireless worker and traveler and a fearless champion for social justice and civil rights. 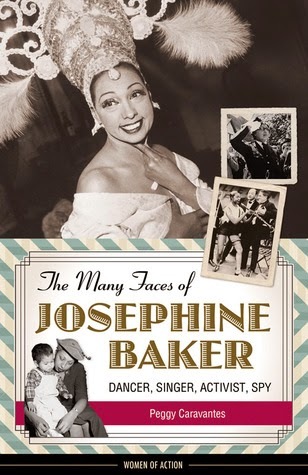 As the title and subtitle of the book indicate Josephine Baker was many things: dancer, singer, activist and spy but also visionary, mother, wife, lover, daughter, sister and friend. Peggy Caravantes' The Many Faces of Josephine Baker is a simple yet informative biography presented with a young audience in mind. Students who read this book will learn about an important figure in the history of African-American performers, the Civil Rights movement, WWII, the Cold War era, the theater life of Paris and much more. I would not limit this book only to young readers as it serves as a nice primer to the life of Josephine Baker. I didn't know much about her and this book served as a wonderful introduction. I plan to read Josephine and the Rainbow Tribe by Matthew Prat Guterl, a scholarly text about Baker's failed utopian experiment. I found this part of Baker's life fascinating. It's thoroughly covered in Caravantes book but my curiosity makes me want to read even more about it. Baker grew up poor in St. Louis. Her poor upbringing had both positive and negative effects on her adult life. It both drove her ambition as well as her reckless spending. At one time Baker was the richest black woman in the world however her financial situation was always on the border of disaster. She spent money on extravagancies, travel, animals as well as social justice projects. She was always running out of money. Baker performed on stage for her entire adult life. When in financial despair, those performances always paid handsomely. Besides, she loved the stage. It was never a burden for her to perform and her talent never dwindled. 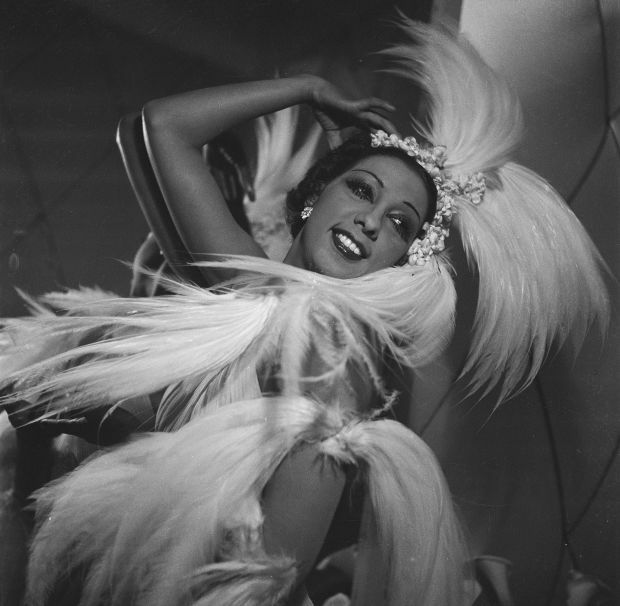 It's safe to say that Josephine Baker was happiest when she was performing. How did Baker become one of the most famous black women in the world? Sheer perseverance. Josephine Baker made opportunities for herself and would take advantage of any situation she could find to move up in the theater world. She went from living in poverty in the segregated south to living in Paris and performing at the Folies Bergere. Her knack for dancing and comedic performance as well as her willingness to learn and improve her skills made her talents blossom. This slim volume of a book manages to explore many aspects of Josephine Baker's life. We learn about her love affairs, her husbands and her romantic relationships with women including the author Colette and artist Frida Kahlo. Baker traveled all over the world and made numerous trips through Europe and South America. She felt most at home in Paris. In France segregation didn't exist in the way it did in the US. Baker felt it was unfair that she would be treated well in Paris yet would face racial prejudice in her home country. Baker became one of the earliest figures in the Civil Rights movement and championed many social justice causes. During WWII, she became a spy against the Nazis when she worked for Charles de Gaulle. Until her dying day, she always fought for equality. The most interesting part of the book for me was the extensive look at Baker's Rainbow Tribe. She adopted 12 children, 10 boys and 2 girls, all from different parts of the world, different races and different religions. She purchased a castle, Chateau de Milandes, which was open to the public. With the Rainbow Tribe, she wanted to prove that people from any race or religion can exist together in harmony. She also championed for a College of Brotherhood, an educational institution based on the same idea of the Rainbow Tribe, but it never materialized. The Rainbow Tribe was in many ways a failure. Her career, and her constant need for money, prevented her from putting enough effort into the project that it required, including being a full-time mother to her adopted children. This book includes a fascinating where-are-they-now? chapter in the appendix about the members of the Rainbow Tribe. Fans of classic movies will be interested to read about Baker's friendship with Grace Kelly and about Baker's film appearances. Folks who are interested in 20th century history will be fascinated by all the figures who became pat of Baker's life in one way or other. These include political figures such as Fidel Castro, Juan Peron, Robert Kennedy and Charles de Gaulle. The Many Faces of Josephine Baker is a concise and informative primer on the life of star who made her mark on the entertainment industry as well as on the Civil Rights movement. Thank you to Meaghan from Chicago Review Press for sending me a copy of this book to review! This publisher have some great classic film books coming out this Fall including one on Thelma Todd and a biography on Douglas Fairbanks both of which I can't wait to read! This is the first of my reviews for my Summer Reading Challenge! I'm on a roll with my reading so I hope to have more up very soon. Now I leave you with a film clip featuring Josephine Baker's famous banana dance.